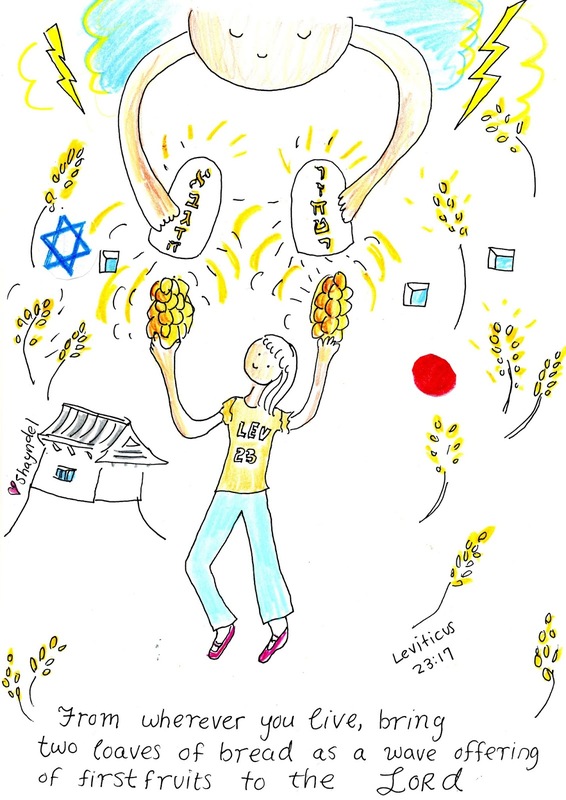 Challah and Cherry Blossoms: Daily Bread Post-card(s)! On Shavuot we are commanded to offer two loaves of bread to the L-RD, to ADONAI, the Almighty Creator of the Universe. And to bring them from wherever we are! Today`s Daily Bread Post-card* is a double portion! In honor of the feast of Shavuot. This week, I will share two postcards!! With two loaves of bread in each!! The scripture is the same in both, Leviticus 23:17. They are both about bringing the offering of two loaves of bread, and waving them as a `wave offering` to ADONAI. 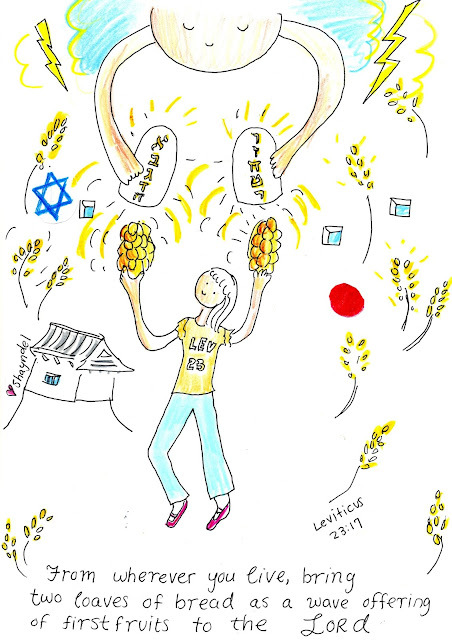 One is a drawing I made at Shavuot last year (below) and one is a drawing I made this year (above). This year, I went out early in the morning once more to wave the loaves up to the G-d of Heaven! When I lowered my hands to bring the loaves back down, there was a flash of light on the `sole` of the two loaves in my hands!!! When I saw this flash of light, I thought of the lightning at Mt. Sinai at the giving of the Torah. I felt that I received something from the L-RD, and everything became peaceful. My heart had a moment of existing in His great Shalom!!! Later on, I tried to draw something about the experience. I looked at my drawing from last year. Although there was something the `same` about my experience this year, I knew something was different. 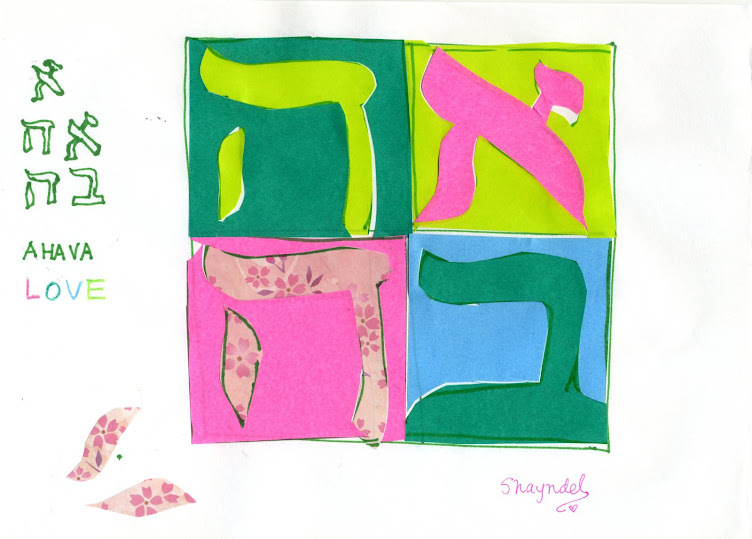 The Feast Day of Shavuot is an appointment to meet the G-d of Heaven. During the 40 days since Pesach we anticipate this meeting and what it will be, as we work on the cleaning of our hearts and making ourselves ready for that meeting. This time I felt He really was there to receive it! 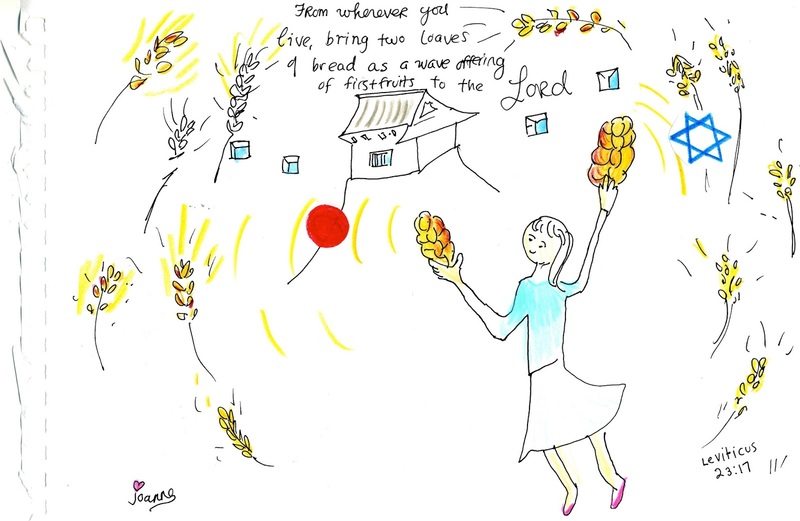 In the drawing (top of this post) I wanted to express that `meeting`, as we lift up the loaves. For each person, Shavout brings a unique moment for each of us to re-live that experience of the giving of the Torah on Mt. Sinai every year, to offer our `firstfruits`, and to re-new our commitment to Him! I hope the drawings can communicate even the least of that in the two postcards this week. Shavuot is also the day that we read about in the book of Acts when the Disciples of Yeshua were gathered in the upper room in Jerusalem. It was on the Feast Day of Shavuot that the Holy Spirit was poured down on the disciples and they received the Spirit of the L-rd! Did you know the holiday known as `Pentecost` was not a `new` holiday, but rather it was on Shavuot, First Fruits, exactly 50 days (Pentecost means the fiftieth day, in Greek) after Pesach, that the Holy Spirit was poured out!!! One of the meanings of the two loaves is that they represent Jew and Gentile, together as one in Messiah Yeshua! Hope you had/having a blessed holiday! Chag Sameach! *Each week for the past ...weeks I have been posting a Daily Bread Post-card. Bread in this feature refers to Challah, which this blog is themed on. In a larger sense, it refers to the word of G-d, which is our daily bread! Because man (and woman) cannot live by bread alone but by every word that comes out of the mouth of G-d (Deuteronomy 8:3, Matthew 4:4). And to take that further, Bread also refers to Messiah Yeshua because He himself is the Bread of Life. Very sweet drawings and meanings. I did not equate Pentecost and Shavout tying in together like this. Thank you for the teachings. I love the Jewish roots meanings of my Christian faith. And your drawings...very precious. Smiles and hugs!